Dogs wont be bugging you to play all the time when they have the P.L.A.Y. 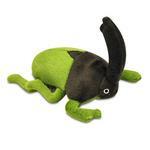 Bugging Out Plush Dog Toy Rhino Beetle! P.L.A.Y.’s Bugging Out Toy Collection won't make you squeamish, in fact they will wiggle their way into you and your pup’s hearts! This lovable plush toy set is inspired by the earth’s friendly bugs and features a butterfly, bee, ladybug, beetle and worm. They are sure to amuse your pup for hours! This lovable plush toy set is inspired by the earth’s friendly bugs and features a butterfly, bee, ladybug, beetle and worm each sold separately. They are sure to amuse your pup for hours!